In reviewing sample performance appraisals, the best always provide a clear narrative on how the form is to be used. 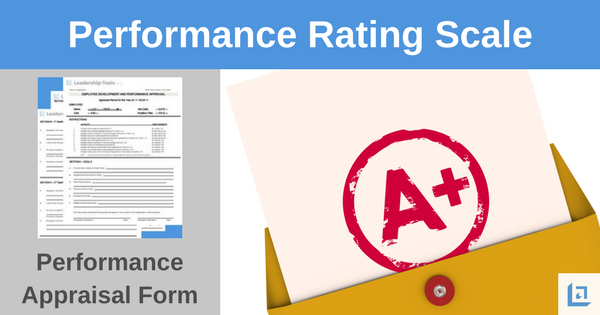 In this section we review the importance of establishing clear guidelines for performance and a rating system that is easy to understand. It’s important that employee’s know where they stand in terms of their performance even before the evaluation begins. In order to provide employees with the clarity they need, you should have established clear goals and objectives at the beginning of the year, and reviewed their progress throughout the year, either monthly or quarterly at a minimum. If you have not yet established goals for the employee then you can use this first meeting to discuss expectations for going forward and schedule regular one-on-one meetings for the coming year to review their individual progress. You must always remember that it is not fair to the employee to hold them accountable for goals that you have not clearly defined beforehand. 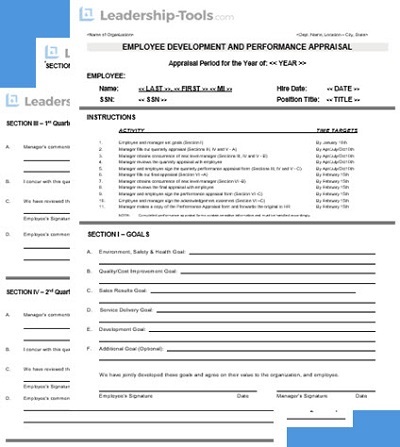 In the two sample performance appraisals provided, you can easily use these forms support your employee discussions and capture progress updates, which you can later use to create the annual performance appraisal document. Well organized leaders keep a file on each employee, documenting their discussions throughout the year so when it comes time to produce the annual review, their notes help to ensure accuracy and consistency. As the leader, your actions impact the perceptions of your team members. By taking notes during your discussions, you are demonstrating to your employee that you value their input; committed to leading a quality discussion, and plan to revisit their progress to goal throughout the coming year. It's important to remember that the performance appraisal is not a time to focus in on the most minute details. Rather, it's a time to summarize the overall performance of an employee and identify a clear action plan for continued growth in key areas. Most employees want to do a good job. They want to be viewed by their leader as a successful contributing member of the team. Most people will rise to a level of reasonable expectation established by the leader. But the leader is responsible for making sure every team member understands what the key objectives are and how you will ultimately measure their overall performance. Establishing clear guidelines and a rating system that is easy to understand will eliminate any guess work for all parties. As you review sample performance appraisals from various sources, you'll notice that some forms use a many categories for assessment, while others appear to be quite limited. The number of categories you use is up to each supervisor or organization. The primary objective is to identify the key performance categories that are required for the employee to be successful in their role. Teamwork and Cooperation – does the employee work well with other team membvers? Flexibility – is the employee willing to do whatever is asked and/or necessary to get the job done in a timely manner? Resourcefulness – does the employee demonstrate creativity in seeking out solutions? Each of the above categories can easily be addressed using our sample performance appraisals. If some categories do not apply in your situation, then use our tool to customize the form so that it meets your specific needs. EXCEPTIONAL - The employee consistently and significantly exceeds expectations of the job in all areas. HIGHLY EFFECTIVE - The employee exceeds expectations in several areas on a regular basis. SOLID PERFORMANCE - The employee consistently fulfills expectations and at times may exceed expectations. NEEDS IMPROVEMENT - The employee’s performance does not consistently meet expectations. A performance improvement plan is required. NOT EFFECTIVE - Even with additional coaching and supervision, the employee's performance does not meet expectations. Immediate improvement is required – final notice should be considered. An easy rating scale of five numbers with clear definitions is something that everyone can appreciate and understand. A clear rating scale limits any potential confusion or misinterpretation. It will also ensure that employees receiving unacceptable ratings can be easily identified so the manager can take clear action to address any issues. This 1-5 rating scale, combined with a clear action plan for future development and realistic goals, will help you to support your employees going forward. Again, it so important that employee’s know where they stand. Use encourage you to leverage the ample performance appraisals provided here to walk you through the entire process. The third topic in our six-part series on sample performance appraisals addresses the critical issue of Using Proper Language, that means knowing what you can say and what you should not say during a performance review discussion.